Purchasers snapped up the full complement of Hereford Bulls exhibited at the Kilkenny Bull Sale this week. 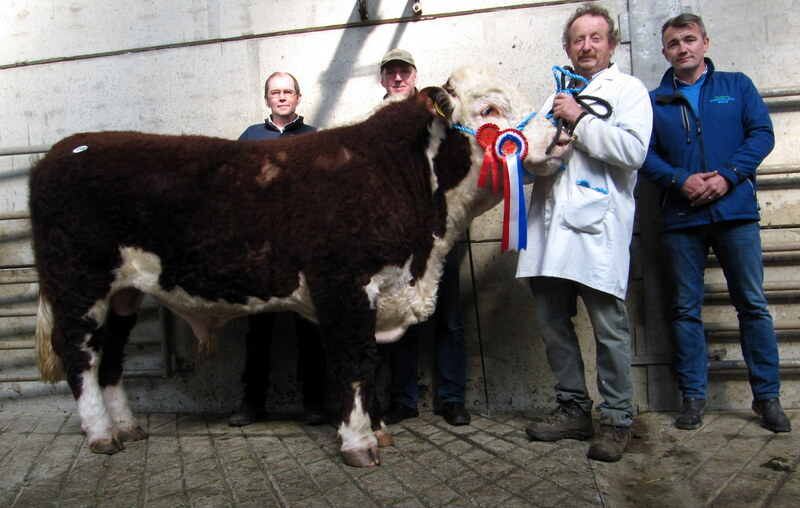 Prices averaged a very satisfactory €3,180 with the top price of €4,500 paid for Chatsworth Hector the Reserve Champion out of the homebred dam Chatsworth Helical 9th by Trillick Winner and was exhibited by local Hereford breeder Tom Hennessy, of Chatsworth, Castlecomer, Co Kilkenny. 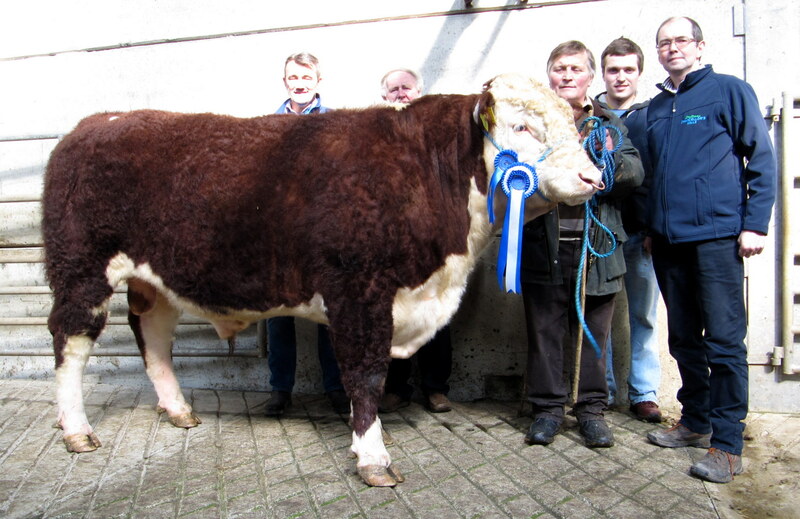 The impressive Allowdale Valour son was purchased by another local man Christy Finn, Bawngarriff, Ballycallan, Co Kilkenny for use as a stock bull in his dairy herd and Bawngarriff Hereford herd. Mr Hennessey was delighted with winning the Reserve Championship and topping the sale a feat he had not succeeded in previously. The show Champion was exhibited by a local breeder Tom Brennan, Balleen, Freshford a regular and oft time winner at Kilkenny. This was a well grown bull by his successful herd sire Lisnaean Donal and out of Balleen Pansy 31st a Gageboro Eugenic daughter he sold to dairy farmer Kevin Rafferty of Passage East, Co Waterford at €3,500. Other useful prices included Knockfin Exotic a Rathregan Upgrader son at €3,200 and Knockfin Garfield by Corraback Fulgent at €3,000 from the herd of Francis Scott, Knockfin, Rathdowney, Co Laois. 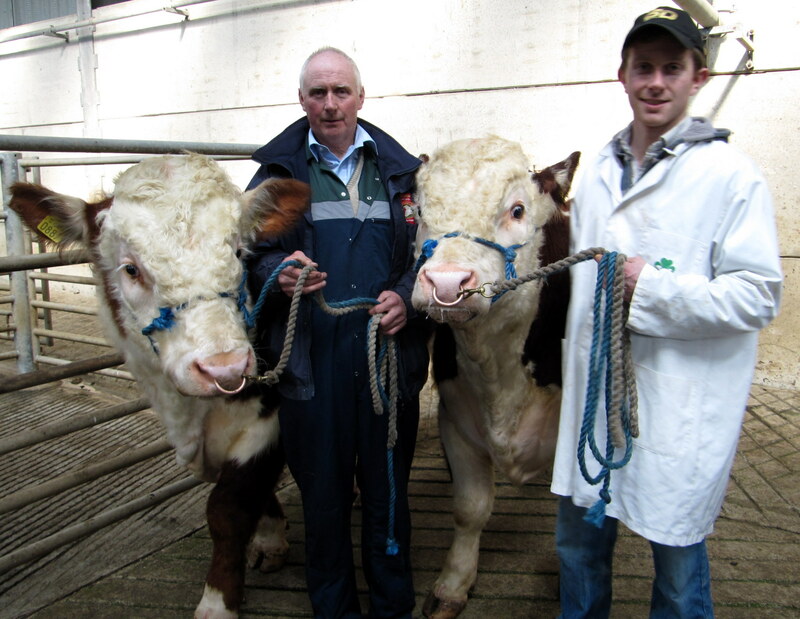 Wexford breeder John Jones of Pallas, Gorey, Co Wexford also realised €3,000 for his Glaslough Esquire son Clonroe Joe. His dam Clonroe Josie is a Castledaly Victor daughter. Overall it was a successful day out for Hereford breeders. The indications are that many Hereford breeders are meeting very strong on farm demand at the moment and that purchasers are buying their bulls earlier this year that previously. Prices ranged from €4,500 to €2,500. Prices for 2 to 3 week old Hereford cross calves are very high this spring with last year’s prices easily surpassed. Demand for quality assured stock ready for slaughter and indeed those suitable for further feeding is very strong at the moment all of which is influencing the demand for Hereford bulls. The Society holds its Show & Sale at Tullamore next Tuesday March 24th where 45 bulls and 7 heifers are catalogued.